Poor living conditions and a lack of smoke alarms have contributed to a spate of deadly fires. 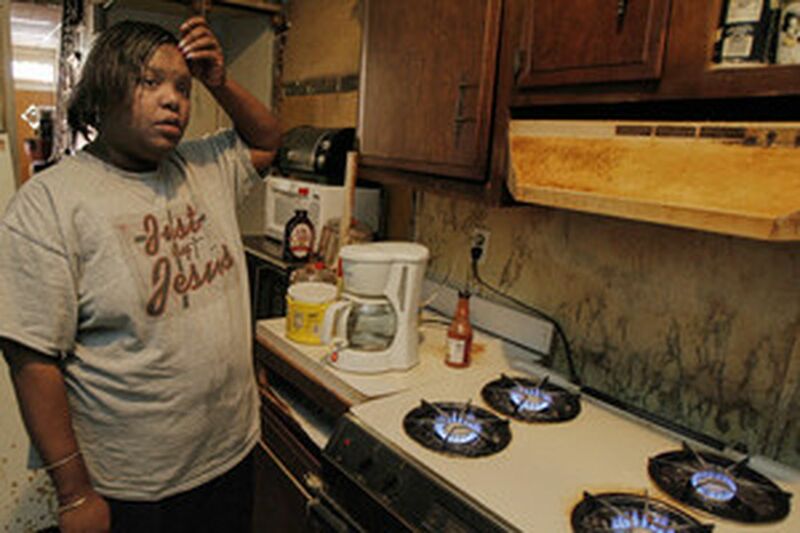 Jacqueline Holmes stands in front of her stove, a source of heating in her two-story North Philadelphia rowhouse. Holmes, like a number of city residents, has rigged up a dangerous system for staying warm; hers involves portable heaters, extension cords, and open flames from burners. First thing in the morning, in a house so cold the water in the dog's bowl turns to ice, Jacqueline Holmes hurries down to her cluttered kitchen to boil water. Not for a cup of tea, but for her bath, and then her teenage daughter's. The part-time cashier doesn't have money to fix her furnace and hot water heater, so she and her son and daughter are in survival mode, tempting fate with a rigged-up system of staying warm that involves two portable heaters, extension cords, "and, I hate to say it - it's a fire hazard - the stove," said Holmes, 43. On a recent afternoon, all four burners were going full blast while, a few feet away, a towel hung from a clothesline strung across the room and water dripped from a gaping hole in the kitchen ceiling. One more thing: The two-story, three-bedroom rowhouse on Ninth Street in North Philadelphia has no working smoke alarms. Such conditions exist in perhaps thousands of homes across the city, places where people live on the edge, overwhelmed by poverty and layers of dysfunction, where grandmas raise babies, where the sick and elderly scrape by, where jobs come and go and families crowd into barely habitable firetraps. "The problem is huge," said Liz Robinson, executive director of the Energy Coordinating Agency, which helps low- and moderate-income city residents meet energy needs. And it threatens not just individual households but whole rowhouse blocks. This winter, the twin menaces of poor living conditions and missing smoke alarms have contributed to a particularly brutal run of fatal fires, with 10 people - six of them children - dying since last weekend. Holmes said it scares her, but added, "You have to stay warm some kind of way." While Philadelphia Fire Commissioner Lloyd Ayers sends crews door to door with free smoke alarms and brochures, and enlists fire-safety block captains, advocates for the poor rail against a cycle of escalating utility bills and shutoffs and the risky home-heating solutions that result. An 81-year-old man who died in a fire last month in Kensington had two 100-pound propane tanks in his rowhouse, one of them attached with a rubber hose to a gas burner that was his primary source of heat. "We all could have died in that one," said Executive Fire Chief Daniel Williams. More than 7,700 Philadelphia households were without central heat as of the end of January due to termination of service by Philadelphia Gas Works, the municipally owned utility that is the primary source of home heating in the city. "It's concerning to us any time we know there's a household out there without heat when it's cold," said PGW spokesman Doug Oliver. "But we can't allow a customer to continue to use gas they're not paying for." The long-term solution, Robinson said, "is to weatherize these homes like crazy - not just for poor people, but for everyone - and to move to more affordable ways of heating." Short term, there is emergency help from the federally funded energy assistance program LIHEAP and state grants. PGW, Peco Energy Co., and other utilities offer grants, discounts and payment plans. Even in combination, those sources don't always close the gap. Someone qualifying for the maximum assistance might get around $1,300, but the typical utility user whose service has been terminated owes PGW $1,500, Robinson said. "There's not enough money in the world to pay everyone's utility bills," said Jerry Bennett, director of programs for ECA. So people improvise, with disastrous results. They heat water on top of space heaters, splice wires, overload antiquated electrical systems. Just last Sunday, 25-year-old Cornellry Robinson and her four small children died in a boarded-up West Philadelphia wreck that firefighters said had an illegal electric hookup and a maze of space heaters and overloaded outlet strips. Her home, like the eight others in which fatal fires have claimed 18 lives this year, had no smoke detectors. "No early warning," Ayers said. "People think, 'It's not going to happen to me,' but it does, and then you hear the wailing and the crying." In the last two years, his department has installed more than 10,000 smoke detectors in homes, but he estimated that up to 10 percent of Philadelphia households still need them. The Wissinoming house where Lydia Muniz, 26, lived didn't have them when she moved in, and it worried her. Her sister's boyfriend bought some, but they weren't working the night her sister left a candle burning atop the television in her room. "It just slipped our minds to get the batteries," Muniz said. On Jan. 24, she woke to screams, and escaped with her daughter and another roommate from a blaze that killed her sister, her 3-year-old nephew, and her sister's boyfriend. Thoughts of those smoke alarms haunt her. "If we would have went and put the batteries in . . .," she said last week, her voice trailing off. "I have so many things going through my mind, so many what-ifs." Jackie Holmes worries, too, but not enough to stop firing up the burners on her Kenmore, and running cords every which way. She did call the Fire Department's Smoke Alarm Hotline (215-686-1176) to request smoke detectors after she was provided with the number. "I'm embarrassed about my whole situation," said Holmes, who dropped out of school in 11th grade and lived for a time in a homeless shelter. She said she couldn't afford to even get an estimate for repairs to the furnace and water heater. Liz Robinson, of the energy agency, said Holmes could get aid, if she can prove she owns or rents the home. Holmes brightened when she heard that. "I do rent it," she said, "from my mother." She said she was going to try to get help. Sloshing up the stairs with boiling pots of water is too much. Same with watching her daughter wash her hair in cold water. "This," she said, "isn't the way we should be living." Eighteen people have died in fires this year, all in homes without smoke detectors, some in dwellings without working utilities or central heating. That is triple the number a year ago. A 19th victim, a 75-year-old woman, died in January from injuries suffered in a 2006 fire. Feb. 14: 100 block of North 57th Street: A 6-month-old, a 3-year-old, and their great-grandmother died. Cause: a toddler's playing with matches. Feb. 12: 1900 block of Ingersoll Street: A 73-year-old woman died. Cause: a faulty extension cord. Feb. 11: 5900 block of Walnut Street: A 25-year-old woman and four children younger than 6 died. Cause: faulty wiring. Feb. 10: 1200 block of Latona Street: A 28-year-old woman died. Feb. 3: 4900 block of B Street: A 68-year-old woman and a 42-year-old man died. Cause: a pot left on the stove. Feb. 1: 4000 block of Parrish Street: A 60-year-old man died. Cause: a desk lamp too close to combustibles. Jan. 24: 2000 block of Anchor Street: A 19-year-old woman, a 3-year-old boy, and a 22-year-old man died. Cause: a candle left burning overnight. Jan. 10: 3172 Amber St.: A 70-year-old man died. Cause: space heater. Jan. 10: 112 E. Cumberland St.: A 81-year-old man died. Fires have killed 18 people in the city so far this year. A15. Neighborhood Energy Centers can help people meet energy needs. A15. Contact staff writer Julie Stoiber at 215-854-2468 or jstoiber@phillynews.com.